Item: Car / Vehicle Sun Shades: Buy 2 get FREE DELIVERY! 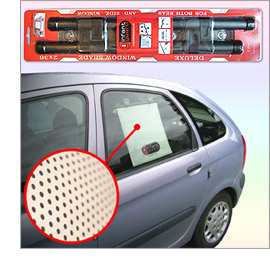 A pack of two sun shields for your car / vehicle. Suitable for both side and rear windows. Attachable in two simple ways, either using the super strong suction cups or edge clips provided. Simply pull them down when needed and they will automatically stop at the required length; When not required retract them automatically by pressing a small button. These come in packs of TWO sunshields. Buy two or more packs and receive FREE SHIPPING!